The new gourmet cashew butter features cardamom and chia seeds. It compliments Betsy's Best current product line of almond butter, peanut butter, and sunflower seed butter, each enhanced with cinnamon and chia seeds. The new year has brought exciting changes to Betsy’s Best, including a delicious new flavor—Gourmet Cashew Butter—and a refreshed logo. The Gourmet Cashew Butter joins the Betsy’s Best lineup of Gourmet Almond, Peanut and Seed Butters already available, and features a delicious blend of natural cashews with a pop of cardamom and crunch of chia. The unique cardamom cashew blend was the brainchild of Betsy’s Best President and CEO Betsy Opyt. While the cashew and cardamom combination tastes delicious, roasted cashews offer bonus health benefits since they are loaded with vitamins, minerals, fiber and protein. Add the rest of Betsy’s Best all natural ingredients, including Himalayan pink salt, chia seeds and honey, for a cashew butter that’s tasty and nutritious. 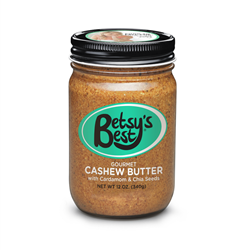 Betsy’s Best will celebrate “Cashew Butter Week” starting Feb. 29 to promote the new flavor. Check out Betsy’s Best Instagram (@BetsysBest) and Facebook (Facebook.com/LoveBetsysBest) for original recipes daily using the new Gourmet Cashew Butter. In addition to the new flavor, Betsy’s Best rolled out their refreshed logo at the beginning of 2016. This completes a full brand redesign that includes updated packaging. Glass jars have been swapped out for BPA-free plastic jars, a change that will pass shipping savings onto customers ordering online. Betsy’s Best® is a gourmet line of delicious nut and seed butters created by dietitian and 2015 Florida Young Mother of the Year, Betsy Opyt. Featuring a signature blend of distinctive, key ingredients like cinnamon and chia seeds, these nut and seed butters are not only healthy but also uniquely flavorful.